On this page you can find information about the Flight Club skydiving school, meet the Flight Club director for skydiving safety and training and select a skydive course which is suitable for your personal experience level from a variety of different skydive training programs. These skydive courses range from Accelerated Free-Fall courses and skydive licensing support intended for beginners, to personal coaching for advanced flyers and skydive instructor rating certification courses for the professional skydiver. You can find a brief description for each skydive training course in the respective sections (to the right) on this page. From there, links will guide you to comprehensive in-depth tutorials containing information regarding course curricula, registration requirements, associated tuition fees and booking procedures. 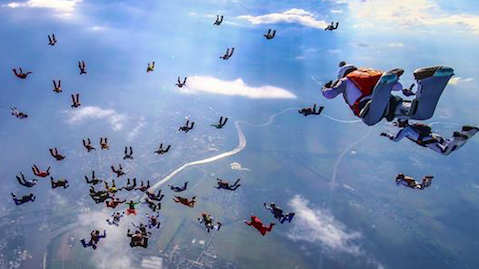 The Flight Club skydiving school administers these skydiving courses year-round on the territory of Aerograd Kolomna near Moscow in Russia and, upon request, at a drop-zone near you. New to skydiving? No worries, our experienced instructors are here to help you find your wings! Learn basic survival skills and elementary tricks for free-fall and canopy piloting in an Accelerated Free-Fall (AFF) course. This 10 jump program follows a simple to complex progression through the student skydiver's skills grid and is being administered in a one-on-one format by your personal coach. Visit our Accelerated Free-Fall skydiving course tutorial and learn all there is to know about program structure, associated tuition fees, registration requirements, course dates and booking procedures. Once you have successfully mastered all targeted learning objectives of this introductory AFF skydiving course, you will be a qualified self-supervised skydiver, meaning that you have been cleared to skydive without instructor free-fall supervision. With more than 20,200 skydives and around 300 hours of free-fall experience, Stephan is nothing short of a skydiving machine. Over the past 25 years, he has made a name for himself working in lead positions with the who is who of the international skydiving scene. Stephan has traveled the world as a coach certification course director representing Skydive University Inc., founded the Arizona Training Centre in Eloy and worked as chief instructor at the New Zealand skydiving school and at Skydive Dubai. In addition, he spent some years as alternate and training partner to world-champion competition teams Arizona Airspeed and the US Army Parachute Team- the Golden Knights 8 way. He holds coach-, instructor- and examiner ratings endorsed by the respective authorities in USA, Germany, Austria, New Zealand and Russia and is an appointed Safety and Training Advisor to the United States Parachute Association. You can check out Stephan's career profile here. The Flight Club school was originally established on the territory of Skydive Arizona in Eloy, USA, by a loose assembly of five legendary skydivers. 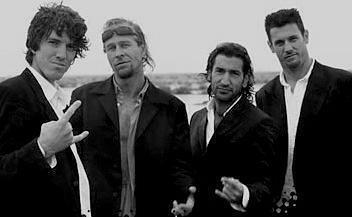 The label soon turned into a wildly popular outfit in the world skydiving scene and things took off from there. Today, the original crew members have moved on to pursue their individual careers, each with great success. 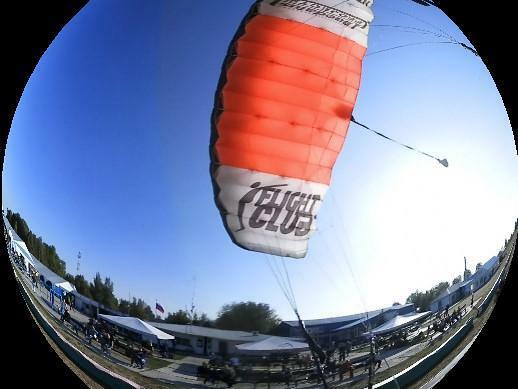 What has remained, is Flight Club's reputation of fielding world-class coaches on the international playing field, providing state-of-the-art skydive student training, load-organizing, coaching and mentorship to skydivers of any experience level. Your safety and the quality of training you receive while skydiving with us are of paramount concern. In Flight Club we have one of the most reputable skydivers in the industry taking care of exactly that. Responsible for everything safety and training at Flight Club is this man right here: Stephan Lipp. Flight Club fields some of the more experienced and sought after professional grade canopy piloting-, free-flying- and formation skydiving coaches in the industry. Find out below how they can help you and follow this link to our comprehensive in-depth skydive coaching, organizing, mentoring tutorials for all associated details including complete course curricula, registration requirements, associated tuition fees and booking procedures. In Flight Club we have some pretty seasoned skydivers in our ranks, pros which have skydived with literally thousands of people over the years. In the process, they figured out how to read the game well and learned to accurately gauge the players on the pitch in no time. We understand that skydivers want to be safe, have fun, push the envelope a little bit and build some confidence in the process and last but not least, make some friends on the drop-zone. Our skydive load-organizers are here for exactly all of that. Our progressive skills development courses are custom designed to help you master individual skills sets in free-fall and under canopy and typically last anywhere from a day to a week. equipment knowledge, effective motor-skill development during the preparation phase, psychological aspects of the in-flight phase, correct execution of biomechanic principles and mental toughness in-air, increased situational awareness and sound decision making under canopy, systematic detailed skill analysis and SMART debriefing sequences. For all those amongst you who are out there on a skydiving mission of some sort and are looking for professional support and guidance along the way to make things happen, this might be for you! No matter whether you want to become a skydiving instructor, compete at the world championship, open an aviation business, run your own drop-zone, need networking assistance in the industry, or simply want to be the best that you can personally be in any specific area of the sport, chances are that we have somebody in Flight Club who has been there and done that and accordingly knows exactly how to go about it all. How to go about qualifying for an USPA skydiving license and what additional training it involves to actually score one, we explain in our comprehensive USPA skydiving license tutorial. For the expert skydiver and for skydiving professionals wanting to expand their activities to another student training method, Flight Club administers skydive instructor rating certification courses upon request. Our Instructor Examiners can help you qualify for Coach ratings, AFF instructor and Tandem instructor ratings sanctioned by the United States Parachute Association (USPA), as well as for manufacturer specific endorsements such as the United Parachute Technologies (UPT) Vector/ Sigma Tandem instructor rating. You can either visit the Flight Club skydiving school at Aerograd Kolomna to train and to qualify for your USPA / UPT skydive instructor rating, or we can arrange for one of our examiners to travel to your home drop-zone and administer the course there. please check out the skydive instructor rating course tutorial for detailed information regarding registration pre-requisites, in-depth course curricula, certification criteria, tuition fees and booking procedures. As the official Aviation and Technical Sports Club of DOOSAF Russia and as foreign affiliate drop-zone of the United States Parachute Association, Aerograd attracts large crowds of visiting skydiving students and sports jumpers alike, making it a giant cultural melting-pot of the world skydiving community. Visitors and guests of the Aerograd Kolomna aviation super-center enjoy a modern onsite infrastructure which is comparable to that of a small vibrant town. It features a hotel, a bungalow district, an apartment complex, a restaurant, several barbecue areas, a full-scale gear-store, fitness area, beach volley-ball field and outdoor soccer arena, a motocross bike rental service and dirt-track, a sauna complex and an indoor and outdoor kid’s club. So plenty of things to do for you and your family, even when you are not busy pushing some air around. 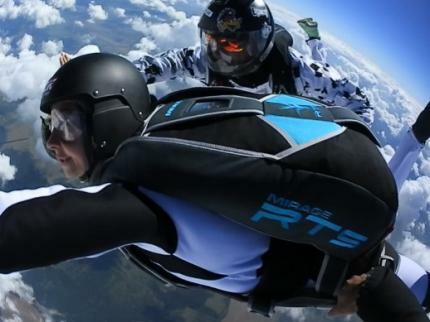 Now that you are skydiving by yourself it's "game-on" and time to take it to the next level. Progress with us through the skydiving ranks and qualify for entry-stage-, intermediate- and expert level skydiving licenses issued by the United States Parachute Association (USPA). an A-license will allow you to engage in group skydives with your friends, a B-license let’s you skydive at night, a C-license enables you to participate in certain demonstration jumps and a D-license will open the door for you to attend instructor rating certification courses. How to go about qualifying for an USPA skydiving license and what additional training it involves to actually score one, we explain in our comprehensive USPA skydiving licenses tutorial. The drop-zone features a sizeable skydiving fleet of 4 Turbo Let 410 series fixed-wing aircraft and a Mi-9 helicopter. 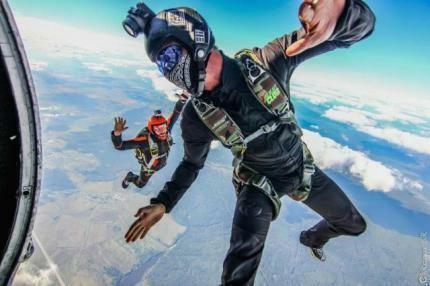 Servicing around 140,000 skydives annually, Aerograd Kolomna enjoys an international reputation as the premier skydiving training venue, for both civilian and military clientele, outside of the United States.